Luang Poh Longkot from Wat Prabat Nampuu, Lopburi joins with Nongprue officials in hosting a Todpa Pa charity event to raise funds for the Glory Hut Foundation. A string of December merit-making events raised more than 2 million baht for the Glory Hut Foundation AIDS charity. 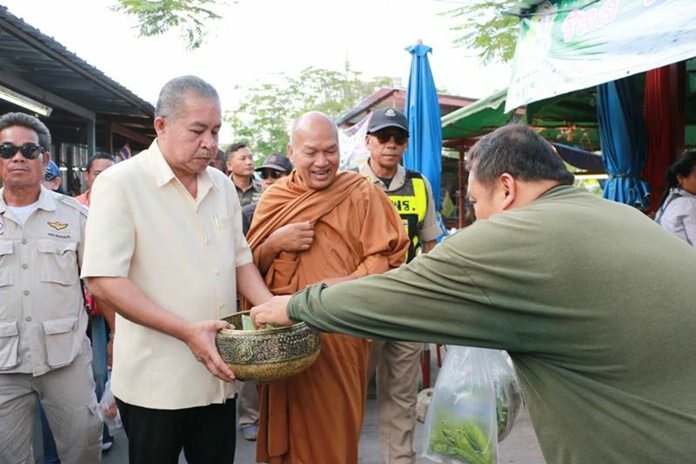 Famed AIDS activist and monk Alongkot Dikkapanyo and Nongprue Sub-district officials presented the 2.1 million baht in takings from three Buddhist alms-giving ceremonies to organization officials following the final event on Dec. 5 outside the sub-district office. Alongkot also led monks in receiving donations during ceremonies at Nongprue Health Park on Dec. 1 and 2. The first day he also led an alms procession from Mike Shopping Mall to Wat Chaimongkol Market, the Grand Hall Market and Big C South Pattaya. Luang Phu Alongkot, as he is known, is the abbot of Phra Baht Nam Phu Temple in Lopburi, which has been caring for AIDS patients since 1992 and filled the gap between government and private sectors in allowing HIV patients to die with dignity. He brought his considerable reputation to bear for Glory Hut, which landed in headlines worldwide in 2012 when residents of Pattaya’s Lang Nern Community voted overwhelmingly to force the non-governmental charity organization to move elsewhere and take its 35 HIV patients with it. Its new facility in Nong­mai­kaen is now close to complete.